Northern Europe is known for its frigid temperatures, breathtaking vistas and friendly and welcoming people. Northern Europe consists of countries such as Iceland, United Kingdom, Ireland, Scandinavia, Baltic countries and many more wonderful places to visit. 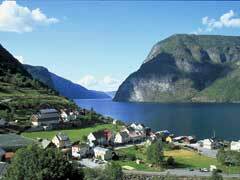 If you are planning one of the many Northern Europe cruises, you will find there are many to choose from. It can be pretty overwhelming trying to decide the best of the Northern Europe cruises to fit your budget. Here we have done the research to come up with the top ten best Northern Europe cruises. 1. 9 Night Baltic Capitals Cruise – For about $1,449.00 per person travelers will be able to spend time in the beautiful ports of Berlin, Tallinn, St. Petersburg, Helsinki and Stockholm. 2. 5 Night Northern Europe Cruise – Starting at only $549.00 per person and offered by Royal Caribbean this is a great cruise if you only can get away for a few days. Guests will have a great time visiting cities such as Amsterdam, Zeebrugge, Belgium and Le Havre, France. 3. 7 nights Northern Europe Cruise – this is one of the best Scandinavian cruises offered by Holland America starting at only $799.00 per person. Visitors will be able to explore the ports of Amsterdam, Oslo, Oslofjord, Stavanger and Norway. 4. 11 Night Amsterdam to Leith by Azamara Cruises – If you are looking for Scotland cruises, this may be the one for you. Enjoy the ports of Amsterdam, Bergen, Molde, Geiranger, Stavanger, and Leith, Scotland. 5. 11-Night Amsterdam Cruises – For about $999.00 per person enjoy the ports of Amsterdam, Copenhagen, Stockholm, Helsinki and St. Petersburg. 6. 28 – Night Western Europe Cruise – For about $4,499.00 per person offered by Costa Cruises visitors will be able to enjoy an extended cruise and visit the cities of Amsterdam, Oslo, Oslofjord, the Isle of Skye, Belfast, Northern England and Scotland as well as Iceland. 7. 12- Night Northern Europe Cruise – For only $1,399.00 per person Royal Caribbean gives guests a chance to enjoy the sites of Amsterdam, Norway, The Arctic Circle and Tromso making this one of the best Norwegian Fjord cruises available. 8. 17 – Night Transatlantic Cruise – For about $3,699.00 per person, enjoy this amazing cruise offered by Holland America Cruises and visit the cities of ports of Amsterdam, England, Ireland, Greenland, Newfoundland, Maine and Boston. This is one of the best extended cruises offered by Holland America. 9. 11 – Night Northern Europe Cruises by Costa Cruises – For about $1,399.00 per person get a chance to enjoy exploring the ports of Amsterdam, Andalsnes, Tromso and Geiranger. 10. 16 – Night Northern Europe Cruise – For about $5,133.00 visitors will be able to enjoy a luxurious all suite ship while visiting Amsterdam, Keil Canal, Denmark and Germany. If you are looking for one of the Baltic Sea cruises that are ultra-luxurious, this is the cruise for you! Whether you choose British Isles cruises or other Western European destination, you are sure to have an exciting and fun Northern Europe cruises experience.